In honor of this week’s Thanksgiving holiday, Winrock’s Director of Volunteer Technical Assistance, Demetria Arvanitis, shares her thoughts on the spirit of volunteerism and many reasons to give thanks. Volunteerism and generosity to neighbors and community have been a part of American culture since the first settlers traveled west seeking a better life. Many historians believe the earliest examples of volunteerism in America began when colonists formed support systems in order to survive the many challenges that came with building new communities. From farming the land to overcoming natural disasters, working together and helping neighbors was vital for survival, and that lesson was not only learned, but carried forward and expanded by future generations. While this spirit of volunteerism flourishes in the US, many Americans have turned this spirit of volunteerism to people, communities and organizations in other countries. Here is what we know: people who volunteer in other countries do amazing work, they make friends and gain a better understanding of other cultures. They learn how we are different and the many ways we are all the same, that people everywhere have aspirations, love their families and want a better life for their children. And invariably, volunteers, whether in America or in another country, will tell you they received more than they gave from the experience. The Winrock International Volunteer Technical Assistance team is humbled by the cadre of dedicated volunteers who give their time and energy to work in rural communities to offer their skills and experience to train, mentor and empower thousands of farmers and their families worldwide. In this time of gratitude, we reach out to say a sincere thanks to our volunteers, Winrock employees in more than 50 countries, and the farmer and community-based organizations that work hand-in-hand with volunteers to truly make the world a better place. 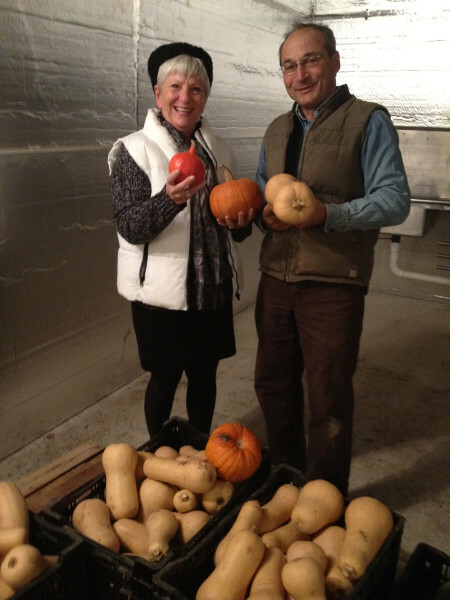 Demetria and Farmer-to-Farmer volunteer Howard Prussack kick-off the Thanksgiving holiday on Prussack’s farm.